You have reached the home of art by Superchrome. Do you want to buy canvas digital printing? Excellent! You are on the correct website. Welcome to Superchrome, the large format printing specialists and suppliers to exhibitions in the UK and worldwide. 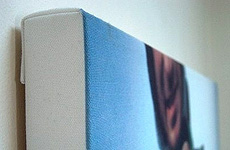 Canvas digital printing is for everybody. Whether you are a business customer, an artist or an individual looking for something for the home or a gift, we welcome you. Expect the highest quality from Superchrome, because we digitally print to create the best graphics possible. When you buy canvas digital printing, you will immediately notice the high quality image. This is because we use digital printing to achieve the best results. Our HP Designjet wide format printers print digitally using images stored on our high tech computer. Our colour-matching technicians provide skills in ensuring that any prints are exactly matched in colour. Superchrome has made it even easier to order. You can still contact us by email or phone, but we have a new online ordering service, so that it is so much simpler to buy canvas digital printing for your home or your office. All you need to do is look at the top right of the screen and underneath the Call back Service or Quote there is a subheading of select upload artwork. This enables you to upload all your artwork in an instant. Any problems, then simply call us or use our call back service. We have a range of finishing options including stretching your canvas print over a strong, quality frame. We can mount or add hanging options too. Please note we can also print onto heavy weight canvas for fine art prints. Contact us when you buy canvas digital printing. Thank you for visiting Superchrome today. We look forward to helping you when you buy canvas digital printing. Thank you for visiting us today and please do not hesitate to ask any questions about the services we provide.